Hints that a 1996-like United Front government in offing. 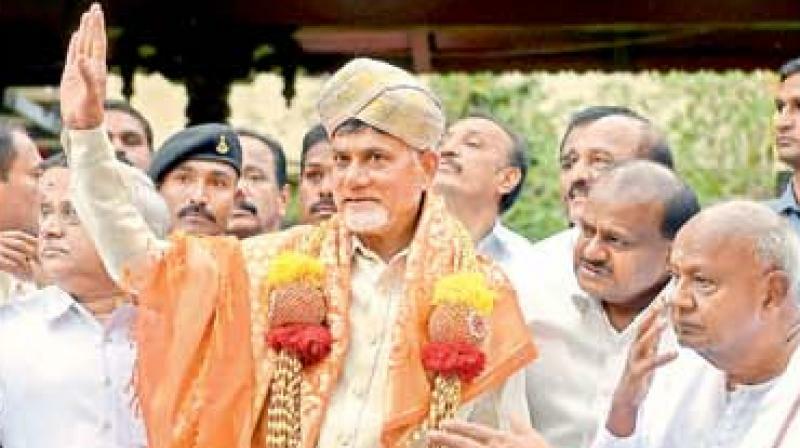 Bengaluru: Setting the pace for the formation of a front of opposition parties ahead of the 2019 Lok Sabha polls to take on the ruling BJP, Andhra Pradesh Chief Minister, N. Chandrababu Naidu met JD(S) supremo H.D. Deve Gowda and son H.D. Kumaraswamy in Bengaluru on Thursday and gave enough hints that the opposition experiment would be similar to an exercise carried out in 1996 when a United Front (UF) government led by Mr Deve Gowda came to power in Delhi with the support of the Congress. Mr Naidu who broke away from the NDA a few months ago on the issue of a special package for his state, has been spearheading the campaign for a grand alliance of the opposition. “We had a similar government in 1996 led by Mr Deve Gowda with the Congress supporting it from outside. The Congress is the main anchor and the BJP is our main rival. I spoke to Mayawati, Akhilesh Yadav and tomorrow, I am meeting M.K. Stalin. All of us will come together to save the country and save democracy,” he said adding that West Bengal CM Mamata Banerjee would be hosting a rally in January.